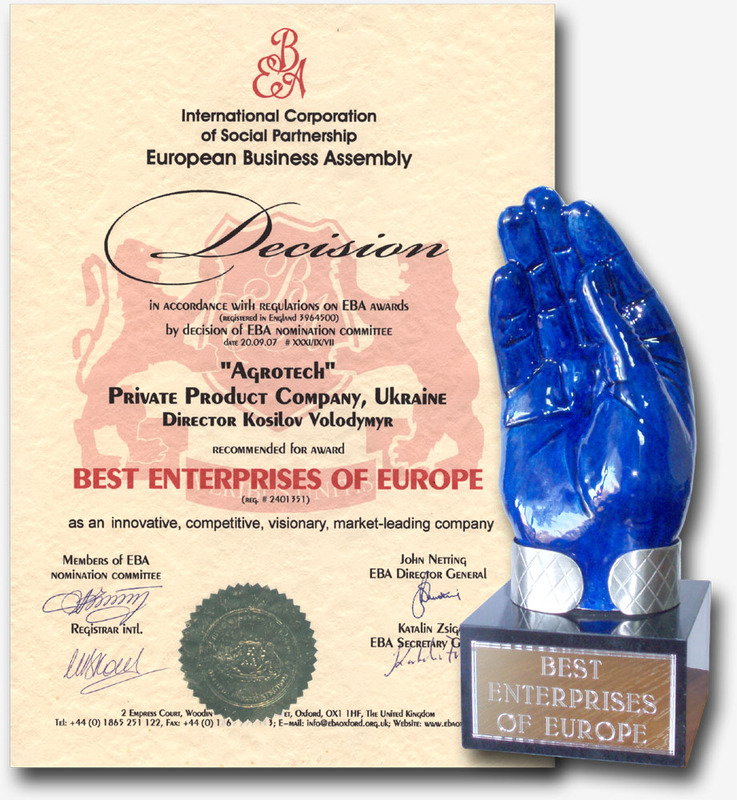 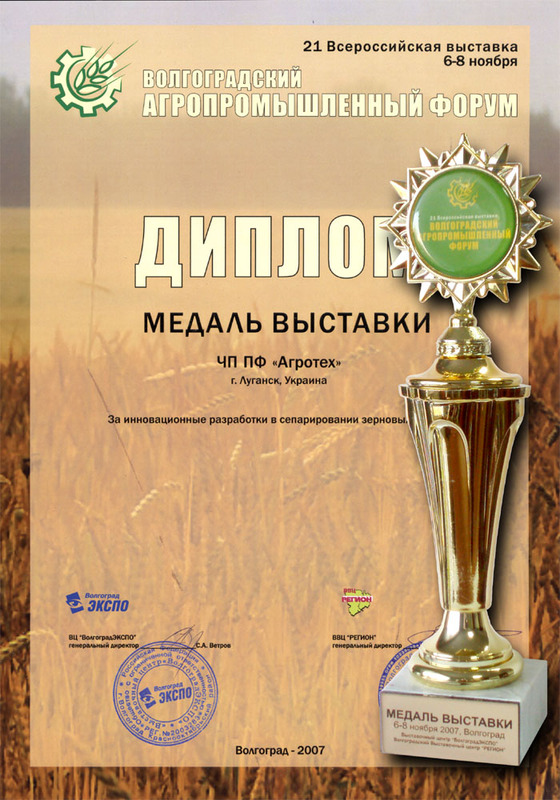 Awards :: The Private Enterprise Industrial Company “Agrotech” is the plant-manufacturer of the grain separator "Almaz"
Private Enterprise Production Company “Agrotech” was awarded with “European quality” International prize FOR CONFORMITY OF PRODUCTS AND SERVICES WITH EUROPEAN STANDARDS. 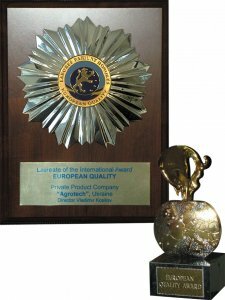 This supreme symbol of international recognition is awarded to leading companies for highly significant quality and competitive products and services. 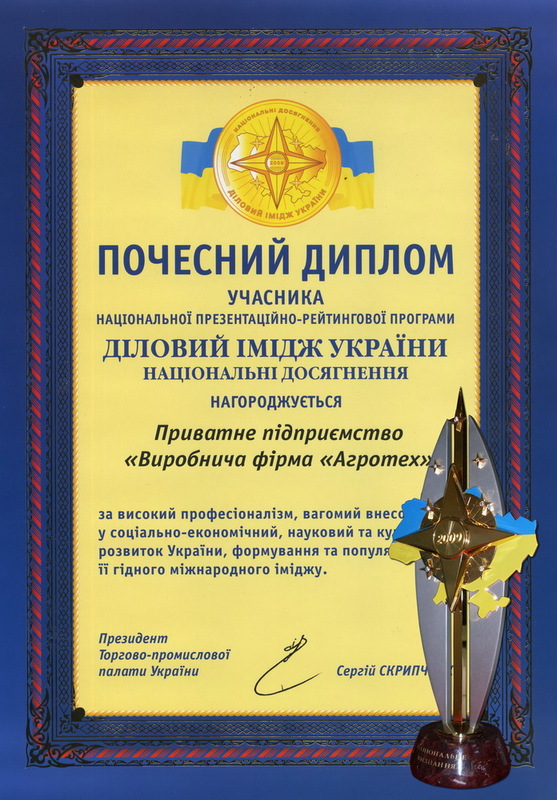 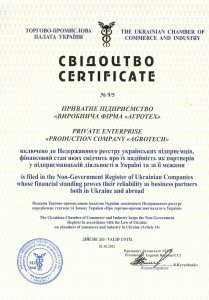 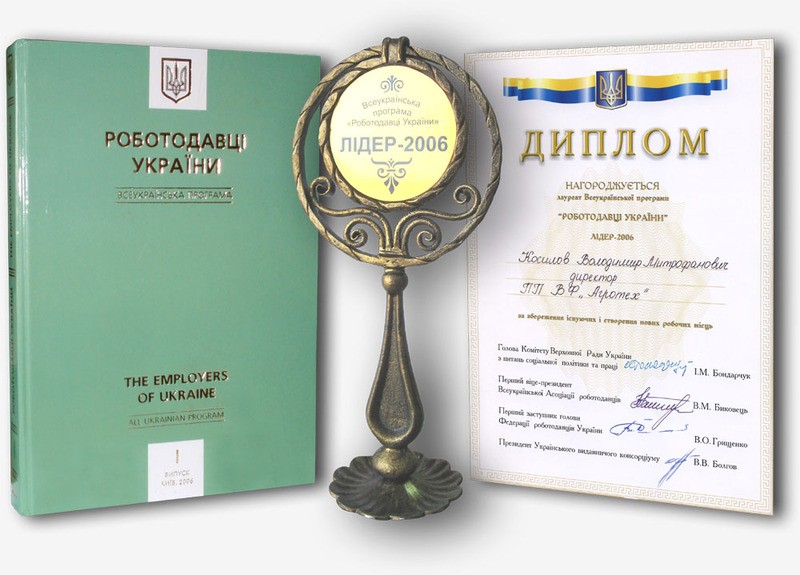 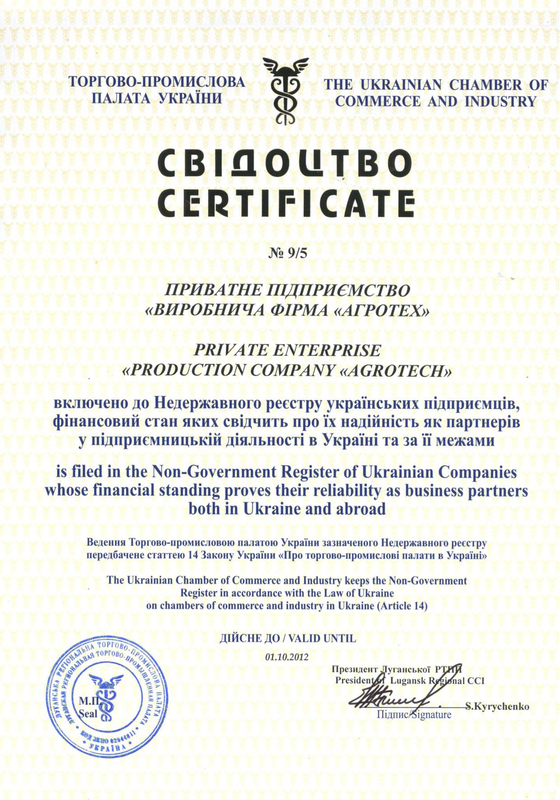 Certificate of inclusion into the Non-state register of Ukrainian enterprises, financial conditions of which prove their reliability as partners in business in Ukraine and abroad. 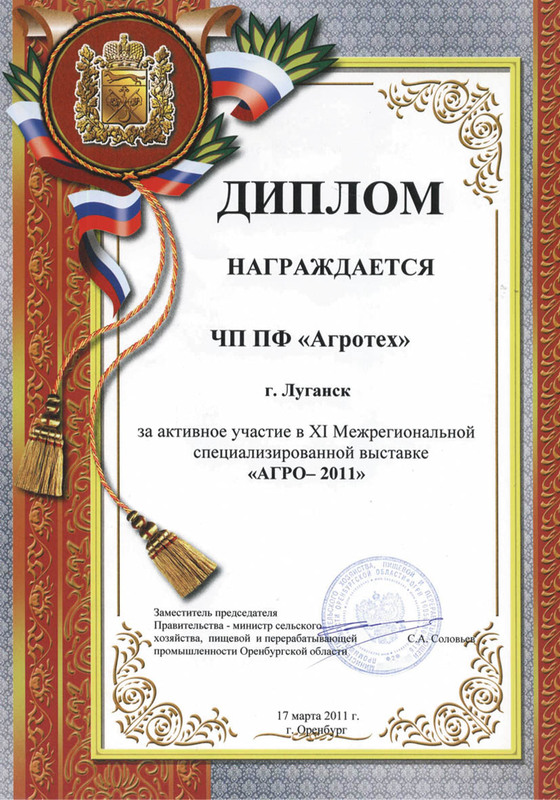 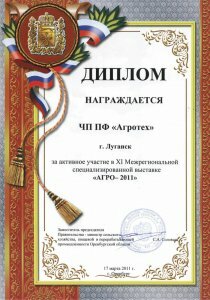 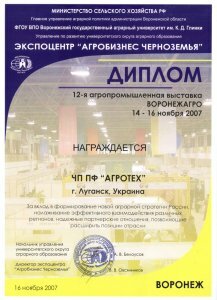 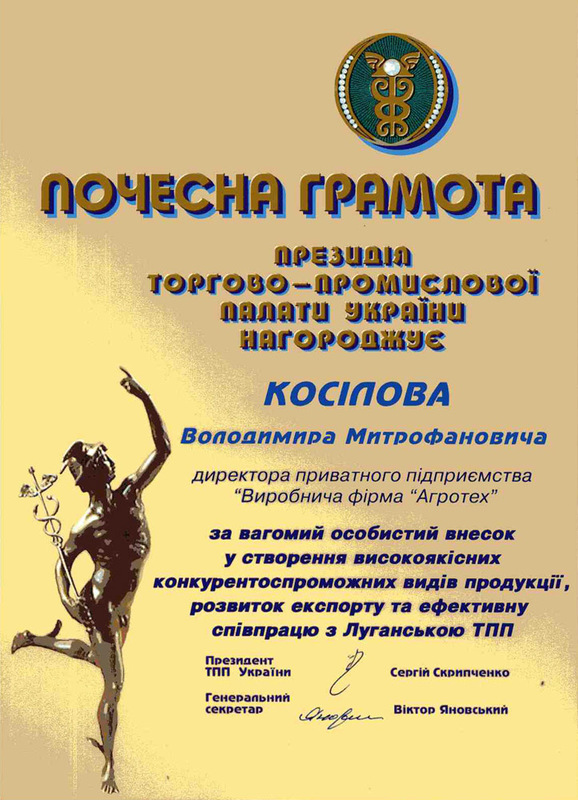 Diploma of the 25th Russian specialized exhibition "VolgogradAGRO" presented for the high quality of products and active participation in the exhibition. 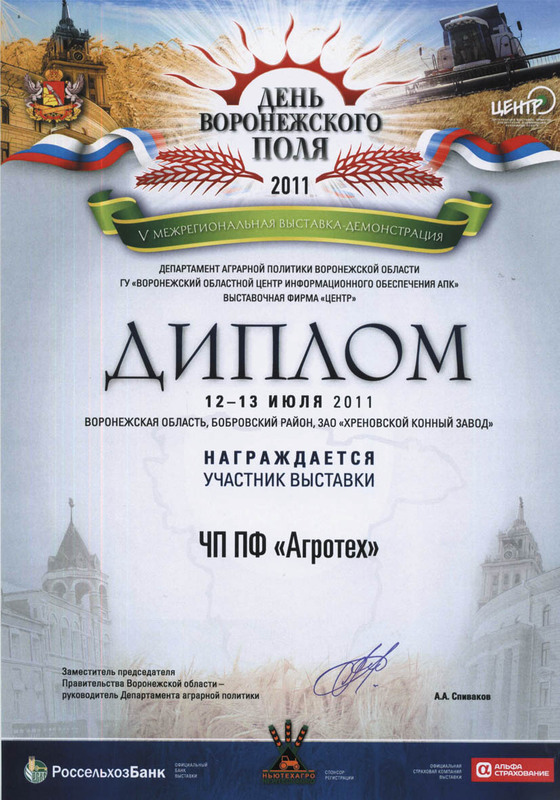 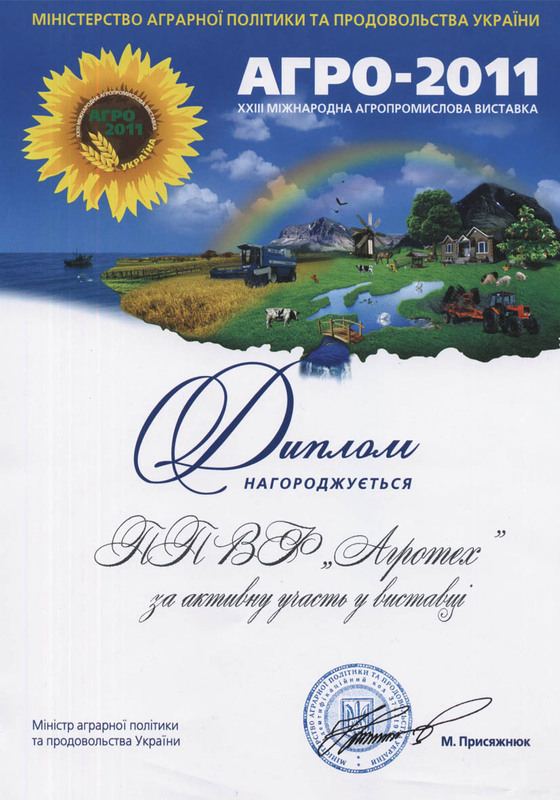 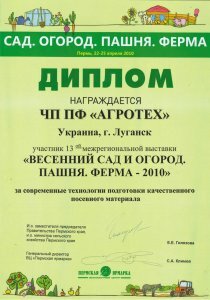 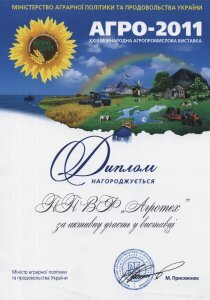 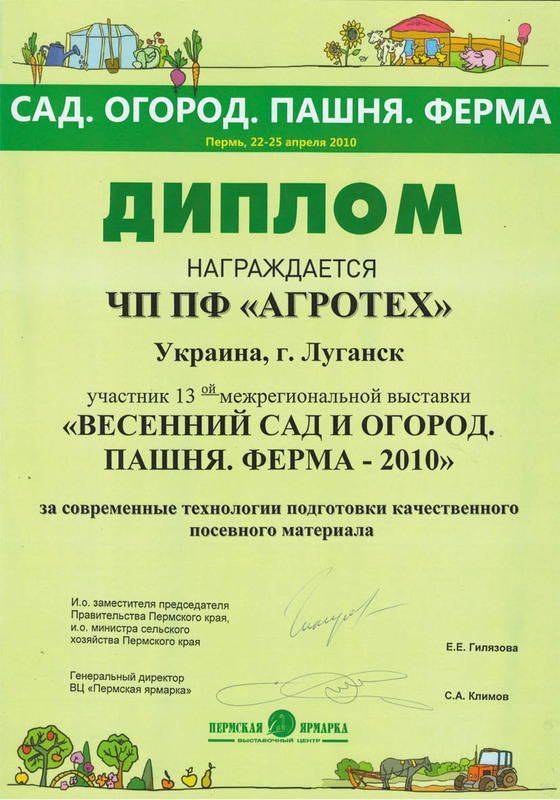 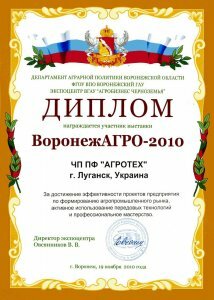 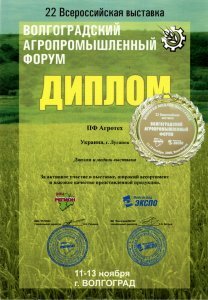 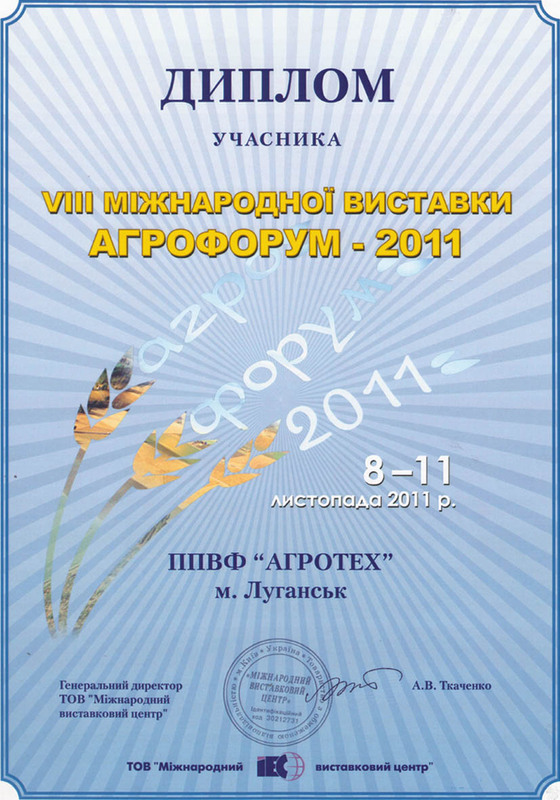 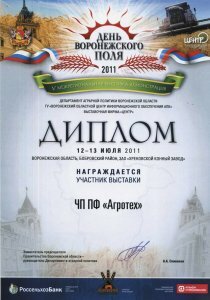 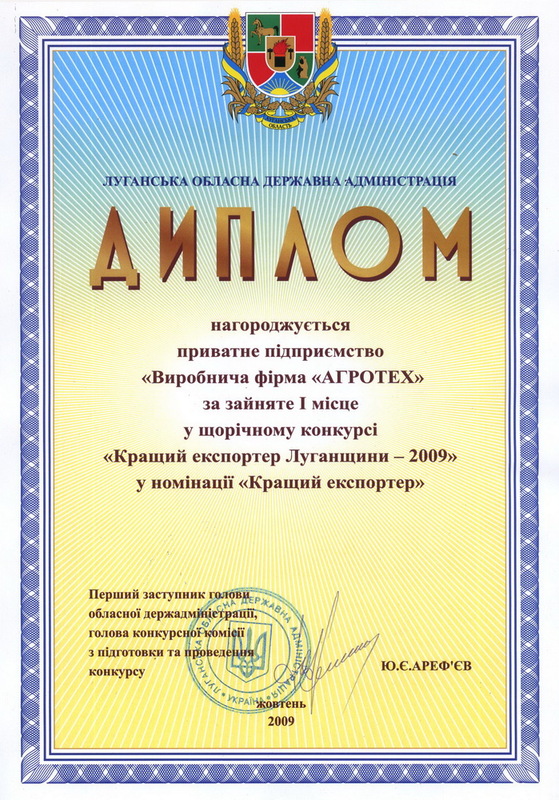 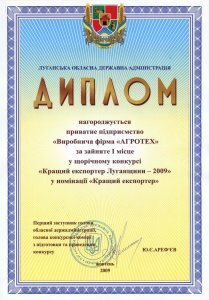 Diploma of the Ukrainian exhibition "AgroProm-Poltava" presented for promoting agricultural development of the region and informative presentation of the enterprise. 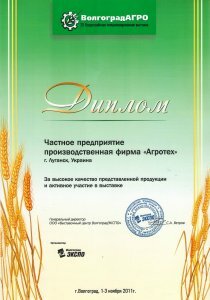 Diploma of "Spring Garden and kitchen garden. 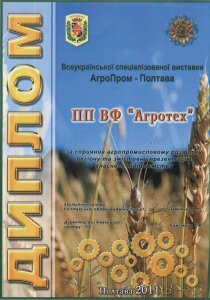 Tillage. 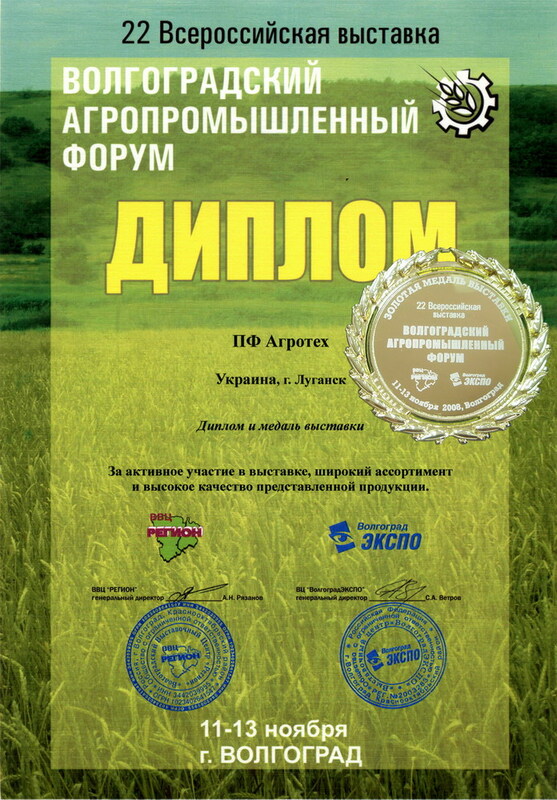 Farm"
Diploma of "Spring Garden and kitchen garden. 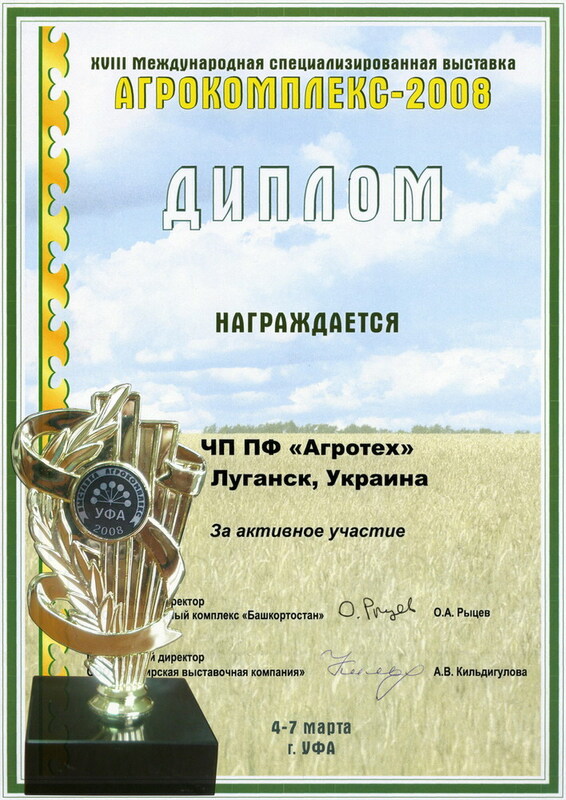 Tillage. Farm", Perm, Russia for advanced technology in preparing quality seed. 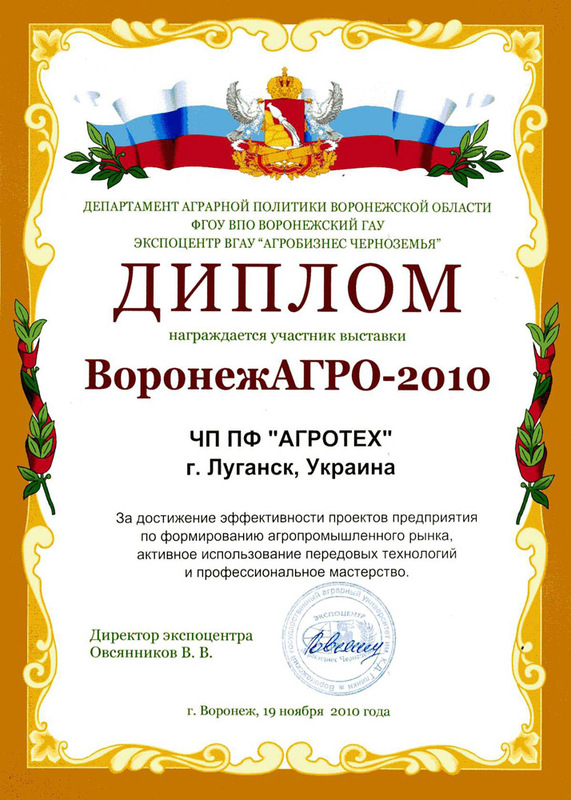 Diploma for the 1st place in the annual contest "Best Exporter of Luganschina-2009" in the nomination "Best Exporter"
Diploma of the annual contest "Best Exporter of Luganschina" organized by the Lugansk regional state administration to promote export of high technology products by regional business entities and to determine the participants of the shared expo booth "Luganschina Export"
Honorary diploma of the National presentation and rating program "Business Image of Ukraine"
National presentation and rating program "Business Image of Ukraine" was created to promote economic, intellectual and cultural potential of Ukraine, expand business partnership, implement joint projects, attract investment resources, form a respectable image of the state, and to strengthen the international position on the world stage. 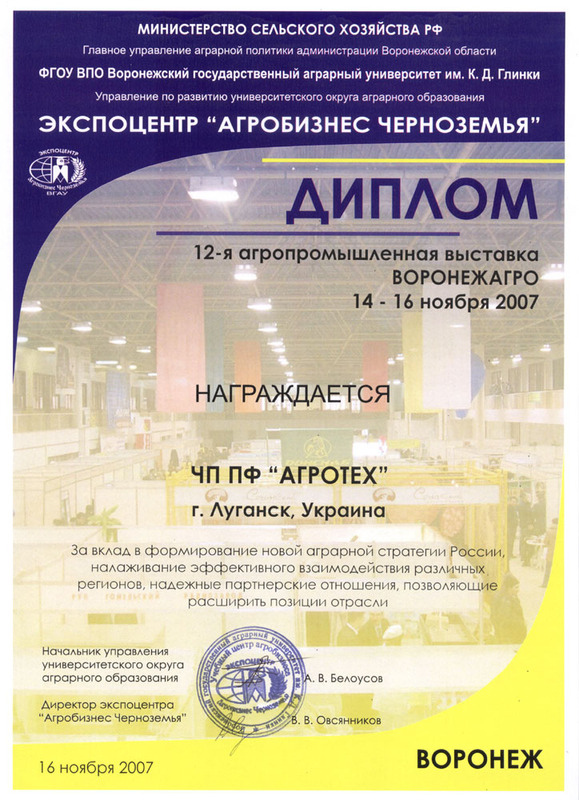 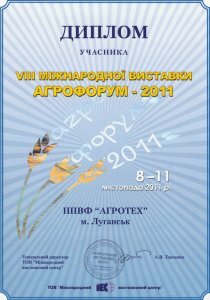 Diploma was presented for active participation in the exhibition, wide range and high quality of the products. 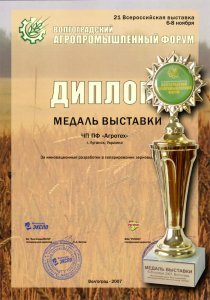 Presented for the contribution to the organization of a new agricultural strategy in Russia, establishment of effective interactions of different regions and strong partnerships that would expand industry positions. Award of the European Business Assembly "Oxford"